In a desperate attempt to deflect from the damage to his presidency, Emmanuel Macron on Tuesday codified what Bernard Connolly has written about for 25 years. As Charles de Gaulle supposedly said to Konrad Adenauer: “Europe is France and Germany, the rest trimmings.” In a resurrection of European history, Angela Merkel and Macron signed a new Treaty of Aachen. While the treaty language is vapid, the symbolism cannot be minimized. Germany and France promise to come to each other’s defense if attacked while also promising to work for a more unified financial and fiscal system. Notes From Underground: Angie, Where Will It Lead Us From Here? Germany chose a new CDU party leader to replace Angela Merkel. Membership chose Merkel’s hand-picked choice Annegret Kramp-Karrenbauer, also known as AKK. This is a very poor choice as it reflects a continuation of the status quo at a time that the traditional German ruling parties are struggling to maintain voter support. These are turbulent times for Germany, Europe and the world and Chancellor Merkel has proven to be too staid to deal with a world threatened by a populist upheaval. There was singing in Rome when Angela Merkel announced that she is stepping down as the leader of the Christian Democratic Union. The two most recent German regional elections has solidified the unmitigated truth about the weakened condition of the German chancellor. For the last six years, I have been highly critical about Merkel’s policies. The bumbling French President Nicholas Sarkozy out-maneuvered Merkel in 2011 as he prevented then-Bundesbank President Axel Weber from leading the ECB. It is always a pleasure to talk with the Richard Bonugli at the Financial Repression Authority. Like Anthony Cruedele of Futures Radio, Richard is a very astute financial mind, which allows for deep discussions in a longer format. We cover several issues discussed in Notes From Underground so I’m sorry if it seems redundant, but I will say that we take a deeper dive on the issues. The segment taped on Wednesday, January 10 so from a trading perspective the information may be stale. But from an investors’ perspective it will still be relevant as the markets begin to unravel the mysteries of a new year. We dive deeper into Europe as I am certain the continent will provide much of the tinder for market volatility in 2018. This weekend proved the case as several stories from Europe propelled the DOLLAR lower as U.S. markets were on holiday for Martin Luther King Jr.’s birthday. Notes From Underground: German Elections. The Sound of Complacency Shattering? I will start tonight’s BLOG with two very good comments from a long time reader and contributor GREEN AB who hails from Germany. Green has always provided great insight and though we don’t always agree I have great respect for his perspective. On Thursday he posted a very prescient forecast about today’s election and Sunday he followed with a post-election thoughts. It is a great honor to feature another podcast with Peter Boockvar for The Financial Repression Authority. Peter is certainly one of the regular commentators that I watch with great interest whenever he is on Bloomberg, Fox Business or CNBC. I think we cover much of the global financial landscape. While it may run long, it is a lot easier than reading a 20,000-word blog post. Pour the scotch and give it a listen. CLICK HERE TO LISTEN TO THE PODCAST EPISODE! I’m still nursing a New Year’s hangover. It takes a long time for the mind to rid itself of all the news the mainstream media deems fit to read. But as the third rock keeps spinning, markets will keep moving and we will strive to untangle the ball of confusion. After today’s tepid ADP data the market has settled into a consensus for 175,000 nonfarm payrolls. Again, I would love to see a number greater than 250,000 just to test the recent market action. BONDS rallied, currencies rallied against the DOLLAR, precious metals are showing early year strength and commodities have held support levels in the age of TRUMFLATIONARY EXPANSIONARY EXPECTATIONS. I’ve been staring at this image and keep thinking about the three living Fed Chairmen that sat on the stage April 7 and the fourth that was teleported from Washington, D.C. I was thinking about the replies to weak questions posed by the moderator and better questions from the audience. I thought about the question I would have asked first. 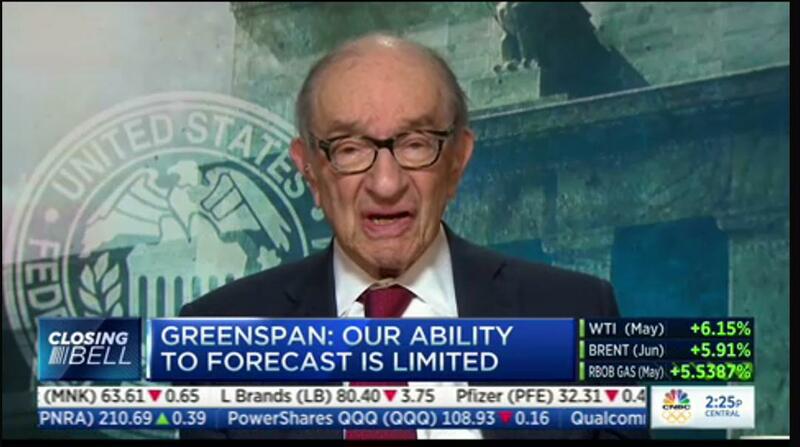 I would have asked each Fed Chair what they had thought about the role of GOLD in the post-Bretton Woods global financial system. Ben Bernanke famously opined that he didn’t understand GOLD but seemed very comfortable visualizing a role for BITCOIN. Yellen has never openly stated her concern about the barbarous relic. Back in the 1960s, Alan Greenspan wrote a serious paper for the Ayn Rand society on the important role of GOLD in a global system and more important for the impact of GOLD for a democratic capitalist world. The main political news of the weekend was the falling electoral support of German Chancellor Angela Merkel in the three regional elections. The refugee issue continued to be the theme of voter discontent, according to the script presented by the nattering nabobs of nonsense. I have written that the financial repression foisted upon the German saving class was going to be a problem for Chancellor Merkel as insurance and pension funds were being punished in an effort to bail out the peripheral banks and ultimately the heavily indebted governments of the non-German core countries. Unlike the U.S., which has some political input on the role of the Federal Reserve, the German electorate is subjugated to a central bank over which it has no authority. As the markets were heading into the close on Friday afternoon, I noticed that silver and gold were rallying and the newswire failed to provide any headline for the a substantial price rise. (There was no Syria news or any other type of geo-political event.) The weekend news also failed to support the rally at least until a few hours ago when the Washington Post ran a headline announcing that Larry Summers had withdrawn his name for consideration for Chairman of the Fed. Many pundits have been maintaining that Summers would be quick to end the entire QE program and thus would have a negative impact on all asset prices. Nonsense in the first degree, but as a trader, the first rule is to respect prices. The removal of Summers has led to the U.S. dollar selling in early Asian trading as the anticipation is now the Fed will be under a Chairman more in step with the Bernanke method of central bank theory.